Your chairs look great! I like the fun fabric and updated look. 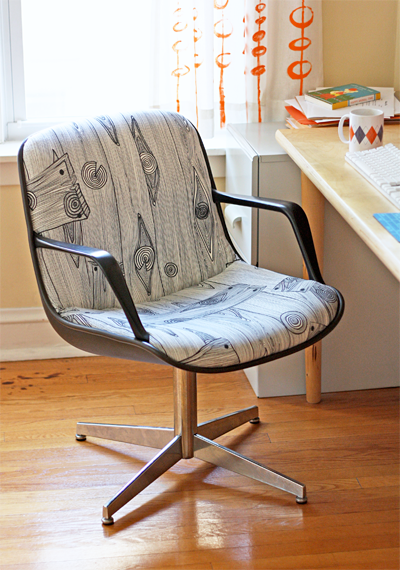 I've reupholstered an office chair before and it can be challenging. Now I'm inspired to look for another office chair myself. They turned out so great! Love that fabric! Thanks for letting us be a part of the job! I guess I dropped one. Love those chairs! What a great idea. Oh, I'm going to look at my chair upstairs now! 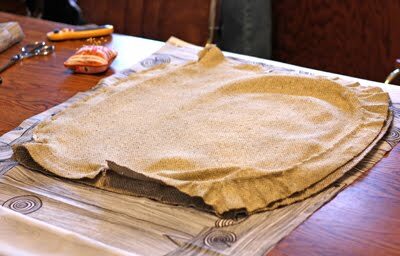 I tried making a slip cover for it a long time ago and never finished. Taking it apart and recovering would be much better! What were you stapling into? plastic? Thanks for the inspiration! They turned out wonderful! I actually use an old executive steelcase desk as my sewing desk. It comes in handy when I am cutting out fabric/patterns because magnets stick to it holding all fabric in place while my shears do their work. Amazin'! You've given me hope in my chairs project (said chairs are languishing in my basement cuz I'm skeered) but NOW - perhaps I'll be brave! Oh wow, I redid a chair like this about 4 years ago...in fact almost identical, except mine didn't have the arms. It was kind of interesting trying to figure out how to take it apart, but it was surprisingly easy to take apart and put back together once I got going. I still have it till today...in fact I'm sitting on it right now. love your fabric choice! Dana, yep, you staple into plastic. I have two staple guns and used both depending on where the staples were going. One did 1/4" staples, and one did 9/16". They look wonderful- the fabric is a great choice with the metal frames. It does look like a physical battle to take them to bits but worth it! Totally refreshed and shiny new! I didn't like that IKEA fabric when I first came across it because I couldn't think of a single project that I would like to do with it. Seems like you found it because with those chairs it really works! Great job! What a great before and after! That's a amazing color! Thanks for sharing! Your chairs look fabulous...thanks for the inspiration. And I have to say--I drive by Jubilee at least once a week, and never had any idea what was inside. Now it is on my list of places to visit, and I'm looking forward to the treasure hunt. Gracias! Can you make one of those for me to BUY!? Those look amazing! 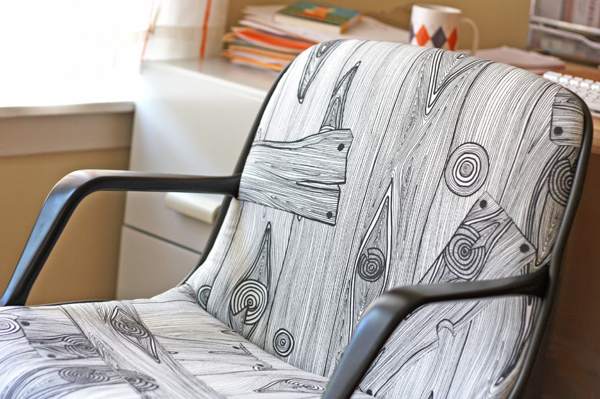 We're in such need of better office chairs, and they are all ugly! I need to pump myself up for a chair remake. I KNEW you would figure out how to reupholster them and make them fabulous, Jessica! They're stunning. I LOVE the fabric. Good job! I love the chairs! I've been afraid of trying the steelcase chairs even though they would make a great desk chair. And I desperately need a new desk chair. Jubilee Furniture sounds like a fun place to go. I'm in Evanston and now its on my list! Love love love these! Wow. Great team effort. Oh! I tried to pry apart these SAME CHAIRS last week and couldn't do it. Now I can! Thank you! I love that you made this a family project! We do all sorts of family projects...it's our entertainment. They turned out so snazzy. These are fantastic!! Thanks for sharing the process. Standing and applauding wildly!! Now THAT is a job well done. Bravo! Super cute! I too love that fabric. Love this chair! Too cute!! 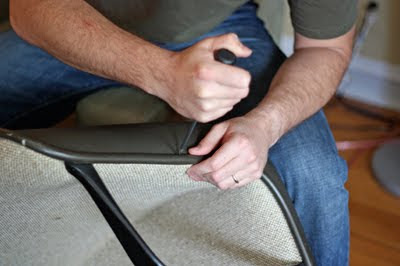 I've got one of those chairs, and I surely appreciate you telling me how to re do it. oh you are good ! These are so cool, love the fabric choice! Thanks for showing us how to recreate this at home. These look awesome! I agree with others -- what fun fabric for them too! The chairs look amazing. Love the fun fabric. Mum, so you found one on the floor? I hope it was on the floor and not in your foot! Yup, it was under the desk. Josie probably hid it there for safekeeping. My husband and I each have one of these chairs in our home offices. He got them from work a few years ago for free. I would never have thought to reupholster them! Although I'm not sure I'm brave enough either. 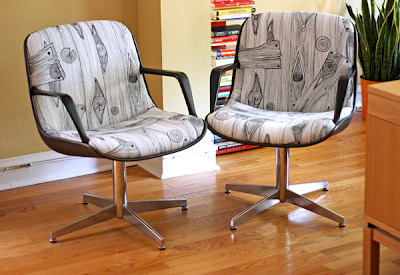 Wood grain makes me so happy and these chairs are just wicked! IKEA has some great inexpensive fabrics - way too cool! Great job! And Love your curtains in the back ground too! Thanks! Fabric paint + cheap Target panels. Great work! I'm impressed that you saw the potential; I'm not sure I would have looked at those chairs twice in their original state, but they look fantastic! LIke many a poster here, I too have those same chairs (in lovely heather tones, mind you) I could not for the life of me figure out how to get them apart. I think I will have to spring for a hank or two of Outside Oslo as a tribute! I really appreciate your blog and all the fab things you pass on to us. Absolutely fabulous! 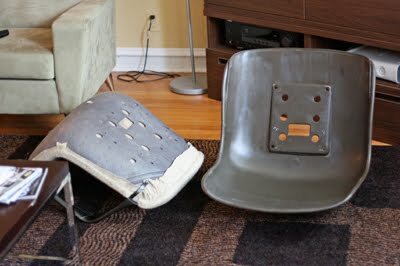 Thanks for the tip on the furniture shop, I've been in need of a new "old" desk chair for awhile. I just LOVE the way your chairs turned out! I LOVE Jubilee! Susan is the greatest! She's our go to when we're on the hunt for something new in our home. Bravo! Fantastic job, these are perfect! Wow! Your chair turns out fantastic and amazing. You did a great job. Big thanks for sharing. Reading this post brought back memories. 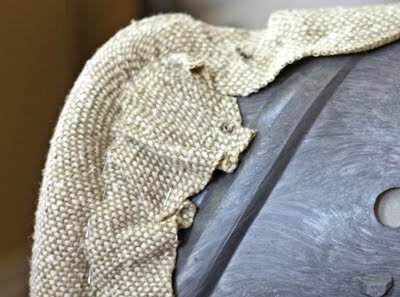 I remember making those chairs in different stages of production but not upholstering. Ahh yes, the staples. 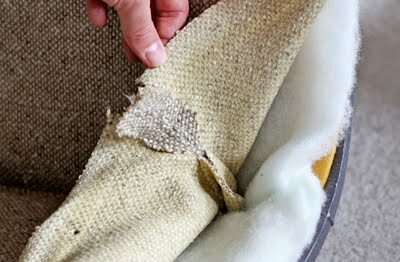 Let's just say that any unsuspecting person walking thru the upholstery department may find themselves being a target for stray staples. And of course, if you turn around to see who shot at you with the staple gun, everyone would be pretending to be concentrating on their work and stapling like mad. Thus 'one' of the reasons for all the staples. Don't even get me started on the 'staple wars'. 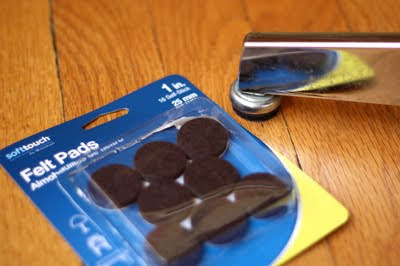 (staples instead of snow balls and yes, they do hurt when you get hit) I enjoy reading your blog and projects. This looks fantastic! I love the choice of fabric. Where did you get this print? The fabric is from IKEA. The link is in the post if you need it. these are GORGEOUS! found them on pinterest when i searched for ikea upholstered furniture. hope you don't mind that i'm linking up to this in my post today about their stylish and low cost fabrics! and, after this, i'm your newest follower!! We have dozens of these at work and every time someone orders a "better" chair, I grab the old Steelcase for home. I couldn't figure out how to get them apart either. Thank you so much! I am so trilled to finally be able to get these going! Can I ask for some more specifics... How many screws hold the back to the front? General locations? Shucks; I'd taken a photo of all the screws lying on a napkin, but I think I trashed it. 12-15, I'd say. It seemed easiest to start removing them near a front corner of the seat, I think. Somewhere around the spot where the armrest joins the bottom. (If I remember right.) And then we just went around with a flat-head screwdriver shoved under the edge of that, um, edging, sliding it along and lifting up that edging until we found the next screw. I just picked up six (yeah, 6) of those chairs for free from an office that was moving. They are TANKS! What nice chairs. I always knew that Steelcase made top quality office furniture and these are no different. I have several that are buttoned upholstery and several that are without buttons, some with arms (exactly like yours) and some with no arms. I even have ONE that is a spring-loaded recliner with arms that feels as smooth as the day it was manufactured. 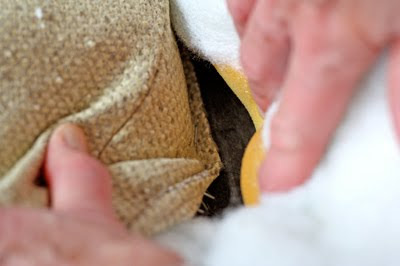 The ones I got are in fantastic shape and condition, even the upholstery is in great shape, save for a couple minor water-soluable deposits of whatever on them. They are all in the shade of Burnt Orange, very retro. I'll post a photo or two on Picasa for the rest of the group. I am almost inclined to keep at least the recliner in the original Burnt Orange, but I'll have to give it some thought seeing your post. Yours came out SOOOO nice! Wow, you're running a Steelcase orphanage! I love it! My theory is, if someone put it together, someone can take it apart. You can do it! Sure thing! I searched the entire internet for just such a tutorial when we got our chairs, and came up empty. Glad this will get you started! great post! I've had two of these in orange sitting in my basement storage waiting to get reupholstered. this may just get me off my keister to get it done. Thank you so much!! This post was such a blessing for me. 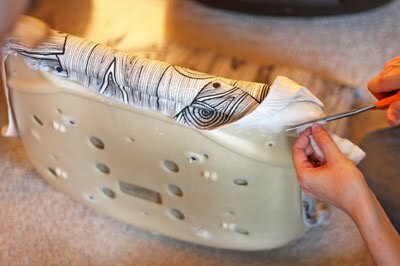 I had all but given up reupholstering an old steelcase chair almost exactly like yours but, you had such an inspiring tutorial I knew I had to go for it. Just found two of these in the storage room at my office and have claimed them for my own reupholster project. Thanks for the helpful instructions! I just snagged one of these, or something very similar, off of the side of the road. Hoping to reupholster it sometime soon. Although mine had casters that would have to be replaced or else they would damage the wood floors, I wonder if I could replace them with feet? Worth looking into, for sure! I've been looking at this tutorial for a while, because I picked up one of these chairs at a thrift store, and finally decided to give it a go! Your tips for taking the chair apart were an excellent help... but now I'm re-assembling and I'm not having much luck getting staples to go into the hard plastic. I'm thinking I might need to get ahold of a pneumatic staple gun, but in your pictures it looks like you used a small handheld one... any tips? I wasn't strong enough to use the heavy-duty manual one, so I asked my dad to do it. That's his big hand in the photo. If I didn't have a dad available with strong hands, I'd go pneumatic. I bought one for an upholstery project I did a few months ago and it's awesome. Those look amazing! Quick question-- do you think those glides could pop off and casters could be installed? I have the same Steelcase chair, but I've been afraid to modify it... any thoughts would be greatly appreciated. Thanks!! I wish I knew! I have wondered that myself! Thanks for the writeup. I got a 11 of these for like $10 a piece, so I'm re-doing a few. I found some really cool casters online, polyurethane, at a place called Mockett. I cant even stand how much i love my "where there's a will there's a way" attitude in my life! (i mean that sarcastically!) I'm SO estatic and grateful for your blog and THIS post! i have been staring at this chair for YEARS ready to vomit what's got to be prettier than this nasty upholstery that's on my SAME EXACT chair right now. i've never investigated well enough to find a brand name AND a year on the chair (model number was too smudged to make out!). But i said to myself, "today is the day.....donate, or figure out what your are doing with this ugly thing!!" 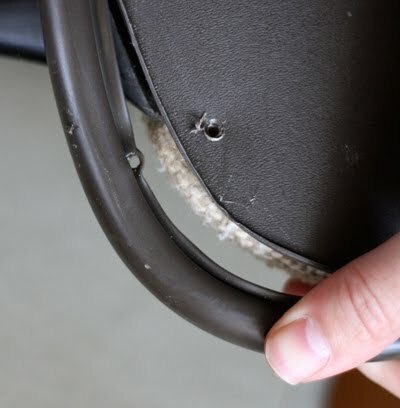 I'm happy to say that i searched the brand and year and your chair reupholstery project is the first thing that popped up and its exactly what i needed because i was a LITTLE nervous to go taking it apart on my own! Thank you SOO MUCH for sharing!! !